Learning Is Evidenced by a Change in Behaviour - Ramblings of Mad Shutterbug & the Border Collie Bros. Prove: 1. Establish truth or genuineness of / 3. Give demonstration of by action / 4. To subject to test, experiment, comparison, analysis or the like. Proof: 3. Act of testing or making trial of anything; test, trial / 7. An arithmetical operation serving to check the correctness of a calculation / 9. A test to determine the quality, durability of materials used in manufacture. / 11. A trial print from a negative. / 13. An impression taken from a plate or the like to show quality or condition of worth during the process of execution. Thus, proof images from photography, given that media more than film exist (digital) will include any of the initial images from the act of calculating light, time, exposure for the effect. They may be for a customer's or artists approval, they may be complete in themselves, or they may be a step along in a process. I generally refer to the first batch of such images prepared for either the party(ies) involved in a photography session or the party(ies) commissioning same, or other designated viewers as the Proof disk. This sparked some thought when one such delivered to a party involved, where the previous interaction yielded a disk with a folder of 'Proofs' and a folder of 'Web Prepared'. The more recent disk included only a folder 'Proofs'. Are proofs 'ready for viewing'? Are they ready for sale? Once being known for photographing in available darkness, now I'm also playing with various types of lighting. 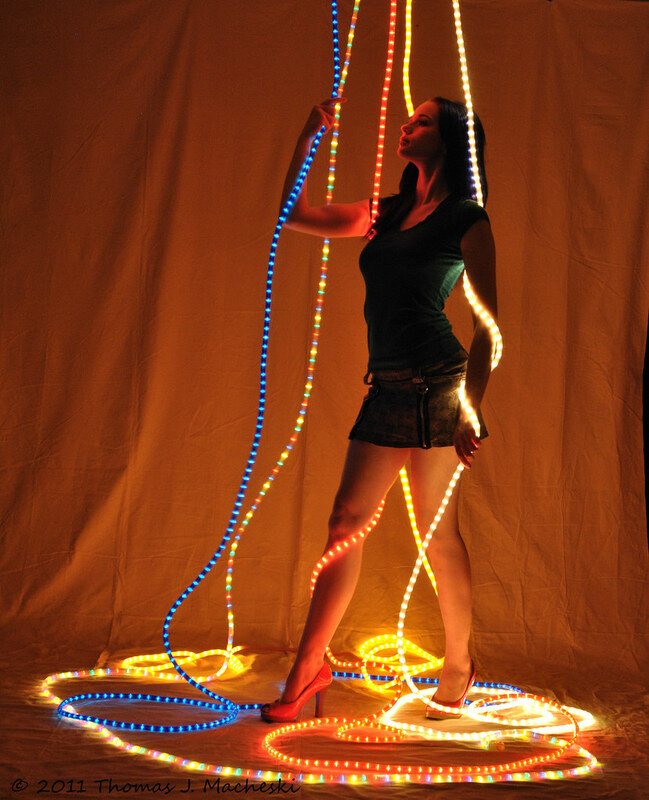 One initial experiment with a LED rope light indicated a very fascinating effect; I expected and am pleased to verify that multiple rope lights provide rather a goodly amount of light. There are more variations to play with, both in shape, size, and colours, before this experiment is done. It is both available light, and available darkness. In truth, all photographs are a combination of both aspects. Some of my experimentation I prefer to do with more or less inanimate items. More or less because some of those items, some of the images resulting, will imply animation. Puppet theatre, for instance, is a core thought in my working with the Otters Mob, the collection of stuffed toy otters I and other friends use. This is partially financial. Often, working with a live model requires exchange of value. Always, for the public exhibition of such work, legally there must be an exchange of value. Sometimes that exchange is subtle, intangible, an interaction between two people who hold each other close, as friends. Sometimes, and somewhat simplified by the very fact, it is more obvious and measured in currency, legal tender for the execution of all debts public or private. Because sometimes, the experiment needs that animation. I also ask myself telling questions. I purport to see a final image and work towards that, called 'pre-visualising' by such as Ansel Adams. However, while I will only exhibit in a show, for example, the final concept, I am not always 'guilty' of beginning the process with that final concept in my mind. I will start with a simple idea, a simple expression: visual illuminated ropes hanging in suspension provide the light for an image. Then while looking at those basic images I start asking 'what if' questions of myself. Combine these within the set done on the day, combine them with other pieces, and what does the ultimate final image bring? What questions does it start to ask the viewer, possibly not seen until the components spark a larger idea. I do pre-visualise, more than I did when I started out studying photography and probably less than I'm inclined to think that Ansel Adams meant when he discussed pre-visualisation. 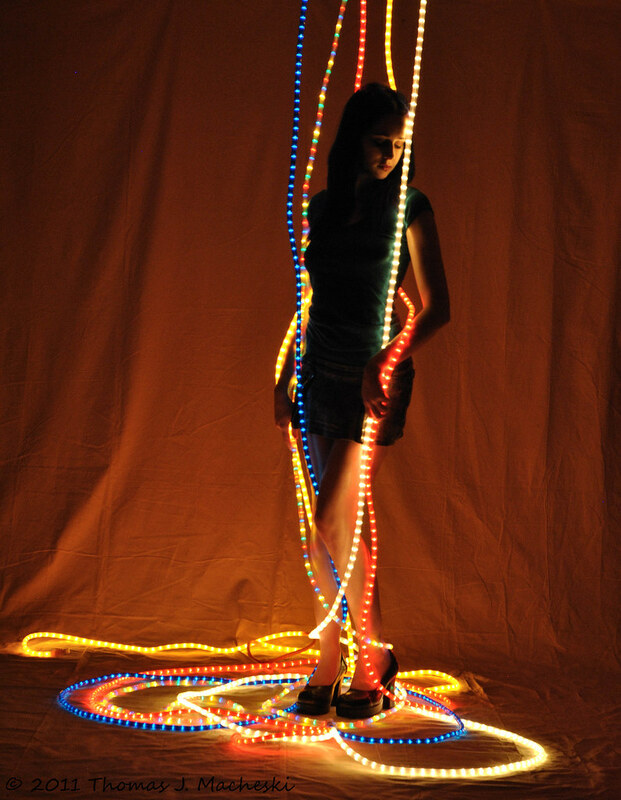 On the other hand, I often start with a basic concept (photograph using rope lights, photograph using a mesh body veil) and then start to see spin-off ideas from the basic images. I know I'm starting from a 'building blocks' perspective. Perhaps better to be visualising specific blocks to a final image. Perhaps more intriguing to make blocks, then start combining those to see what do I get. Sometimes it is nothing more than random numbers. There are a few which you'll see here that I picked. There are others which I simply clicked on file names to build an upload, not looking at anything other than the file name (not looking at their icon images, eh) and uploaded to provide examples for this post. Part of the reason I mention they're on Flickr is, I'm still filtering how I post certain works there based on 'Is the Viewer a Registered Account Holder, and Do I List Them As A Viewer?" Hence, anything following will be visible here, yet won't be visible there (if you follow the link) unless you are able to answer the above question with Yes, and Yes. If you aren't interested in the Not Work Safe imagery, you should be able to skip it even after viewing the earlier three images. Skip all the way down to 'Leave a Comment.' Please do. Leave a comment, that is. The numbers refer to the images, more or less by name. There is a gap here, jumping over more than 100 images. They aren't bad images. They do represent a change in direction for my imagery, and I'm still looking at them while meditating, asking is this a direction I'm willing to go? Once I start showing them, stipulating that I probably will, I expect I may hear responses wondering what my problem is. Ah well. From here on, we stop experimenting with an 'alternate' light source and work with a 'traditional' light source, often called 'hot lights' because they use incandescent bulbs, and do put out heat as well as light. Summarising, then, these are initial pieces following a Studio 318 session. Proofs, if you will, at least that a couple of people came together and exposed light under controlled timing to a sensitive surface. They are tests as to the outcome of the manufacture, as well as the quality of the product. They may be complete unto themselves, they may become portions of a greater whole. In short, they are a work in progress, as well as a work completed. This entry was originally posted at http://madshutterbug.dreamwidth.org/121294.html. Please comment there using OpenID. I love the ones with the veil, especially 0189. Great composition. If I may say so, think you need a flatter backdrop, though. The cloth isn't textured enough for the texture to be part of the art, and the fabric surface is distracting, I think. IMO. There are a couple wasy to interpret 'need a flatter backdrop...' as it were. - Needs to physically be flatter. Ironing that big a cloth is prohibitive. On the other hand, a fabric steamer is not, and I do need to apply it. - Problem is more with depth of field than flatness. And I'm discovering that the smaller physical size of a DSLR sensor compared to either 35mm or 120mm film affects how depth of field for specified f-stops. As in, I'm still figuring out how much I can get, within the confines of Studio 318. - A darker backdrop would also help. Or putting less light on this one, either alternative. Yes, it's really a DOF issue. Right now, the camera is paying equal attention to the models and the backdrop. And because the backdrop is a little wrinkled, it's really obvious that they're posed in front of a piece of fabric. For the moment, steaming it might be the easiest way to, er, iron out the problem. Alternatively, you might try using a backdrop that is textured and draped so that it becomes part of the composition. This is why I stick to bugs, flowers, and candids. Studio photography totally eludes me, although it's on my list of Things to Learn. My little pocket Canon was stolen, and my big Canon is not as smart as today's cameras. Feh. Need new cameras and we're bleeding money to do another move. I discovered last night that Dad, who died two years ago, had been squirreling away silver bouillon for thirty years, along with a note to me. That was kind of like having a ghost pop up to have a conversation. Since the note indicated that he clearly meant this as something to leave to me for its monetary value rather than as something with sentimental value, I might trade it for a real camera, since I've bought nothing that's solely for myself with anything else he left me--the rest is all doing practical things involving debts and mortgages. No camera is ever smarter than the photographer using it. No, of course the photographer is smarter than the camera. But today's cameras easily handle some things that I have to work very hard with on my older digital camera, which don't age as well as film cameras. Today's cameras in an equivalent price range have larger sensors, much higher ISOs, better zoom, and better handling of contrast, faster shutter rate, and faster focusing than my camera, as much as I love it. IHG's new little $300 Canon videocamera, which he also uses for stills, has far better stabilization than my prosumer camera and does a far better job with low light.